Hi, I'm Gracie. On behalf of Furry Feline Treats, aka Cat Treats, I wanted to let you know that I'm getting really bored with my current 'cat food'. Don't get me wrong, it's food — but — you know what I mean. My mom still hasn't had time to concoct some tasty tuna dish ... (well she has for herself!) so I really need your help! The cats at the bottom of the page are my friends too, Whitey and Min Cal. They're not as fussy as I am, but don't tell them I told you that! If you can help out these poor cats of mine by sending in your recipe, that would be fantastic! So, do you want to see your favorite kitty treat recipe along with your cat's photo — right here on this website — which you can share with your friends too? How? Easy! Fill out the invitation at the bottom of the page, and we'll do the rest! Don't forget to attach a photo of your cat, if you want to, and tell us all about your kitty-cat dish creation! Here's Raschell's fantastic site whereby "Miss Home Made" makes ALL her meals from scratch – and she has many cat treats! Click here for Kitty Krunchers, Tuna Cat Food, Fish Delight, Finicky Cat Food – more than enough for any cat! Thanks Raschell, for all these goodies! And when you've made them, dehydrate them! Look what we did for our dog's dinners (yup, I know this is 'the cat's page' but they don't mind – too much). We all love our cats (and dogs). Let's make sure we feed them food that we wouldn't turn our nose up at if we were in their shoes. If you have a dog, check this out. 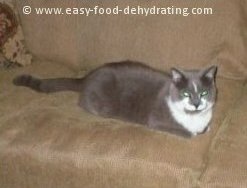 Remember, if you have a cat treat or food recipe YOU want to share, it may be a featured link on our homepage and it'll be your very own page on this website! Important: The recipe must contain at least ONE item that is, or could be, made from dehydrated vegetables, meat, or fruit! What's Your Cat's Favorite Homemade Food? 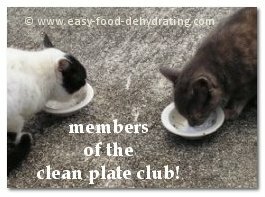 Is your cat clawing to have its photo featured showing us how much he/she enjoys your homemade kitty meals? 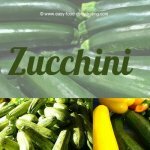 Do you have a great recipe? Share it! Your recipe will be posted "auto-magically" and you'll have your very own recipe and webpage featuring your cat's favorite food! Share your cat's favorite homemade recipe ... Just type it here! ... Please don't use all caps or any HTML as SBI strips it out. But don't worry, I'll make it look pretty for you!